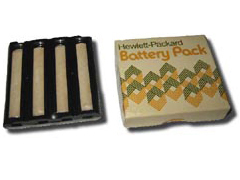 10A or 19C 82052 battery pack, no batteries. Gone! / 10A or 19C 82052 battery pack, no batteries. Gone! [/b]I have a 82052A battery pack in the box without the 4 NiCd batteries. The 82052A battery pack has been taken apart but is in pretty good shape. The springs and three plastic spacers are in the battery frame. The box is in good condition. I'll part with it for a couple of dollars to cover shipping.